Over 2.5 million registered voters across 6 jurisdictions in Florida and one in Arizona leveraged secure and scalable election modernization technology for instant and user-friendly election results of the 2016 State Primary via Scytl Election Night Reporting. Scytl, the worldwide leader in election modernization and online voting solutions announces an additional 2.5 million registered voters leveraged the benefits of secure and scalable election modernization technology. Election Officials across 6 jurisdictions in Florida provided voters and political audience real-time access and visualization of the 2016 State Primaries election results. 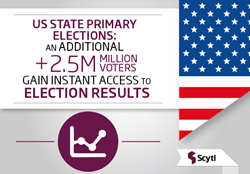 This raises the tally to date to over 27 million voters leveraging Scytl technology during the 2016 US Presidential Primaries. “Scytl’s technology helped our office post results online in a timely fashion. Streamlined processes and impeccable support are just some of the reasons why we selected all of Scytl’s solutions,” says Kathy Dent, Supervisor of Elections, Sarasota County. With the increased attention towards the battleground race for seats in the US House and Senate, real-time and instant access to election results during the August 30th primary was of key significance. Scytl Election Night Reporting provided audiences across 6 Florida counties (Miami-Dade, Pinellas, Palm Beach, Sarasota, Martin and Osceola) secure and real-time online access, catering to the scalability required for added interest and online access to election results. In addition to the support in election results publication in Florida, Yuma County (Arizona) successfully leveraged the newly upgraded Scytl Election Night Reporting technology enabling voters to customize their experience tracking the specific races and detailed precinct data on the results for their State Primary Election. Results visualization: customized and user friendly visualization of election results for citizens. Reporting configuration: intuitive design and configuration for election officials. Scalability: to support multiple on-going elections for jurisdictions of any size. Scytl’s solutions have been successfully used in over 42 countries across the globe over the last 10 years, including Canada, the United States, France, Norway, Switzerland, Bosnia-Herzegovina, the UAE, India, Iceland and Australia. Scytl is headquartered in Barcelona, Spain, with strategic offices in the United States, Canada, Brazil, Peru and Greece, as well as field offices in the UK, Ukraine, Mexico, Malaysia, India, Bangladesh and Australia. For more information, visit http://www.scytl.com.